A great article on the constant “Can I touch your hair?” debate. 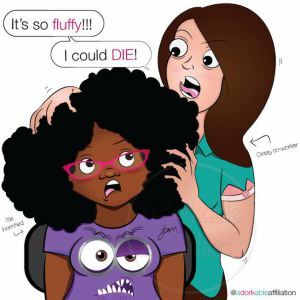 I’m not a fan of the pulling, grabbing, and messing up my style (personally), but for some strange reason, there is still a fascination of Black women’s hair and the desire to “touch” it as though it would bring some insight to another dimension. Why is this still a question that so many of us get? Random Person: “Oh, my God! Your hair is so AWESOME! After going natural 3 years ago, I expected many things to change in my life. I knew there would be both hard times and enjoyable experiences. I knew I might be surprised by what my real, unaltered hair actually looked like. I knew I would have to buy different hair products and start to take care of my hair differently. I had no idea however, that so many strange people would want to touch my hair!